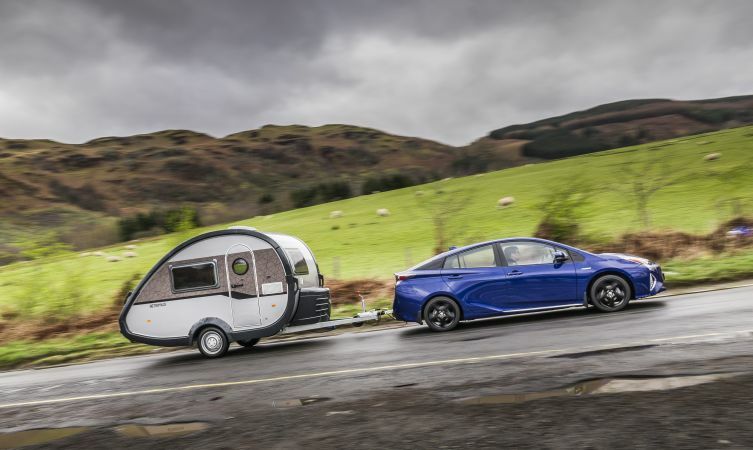 For the first time in its history, the Toyota Prius has been developed with the ability to tow a trailer. This is further evidence of Toyota’s desire to inject greater performance, driving appeal and day-to-day usability into its hybrid hero. 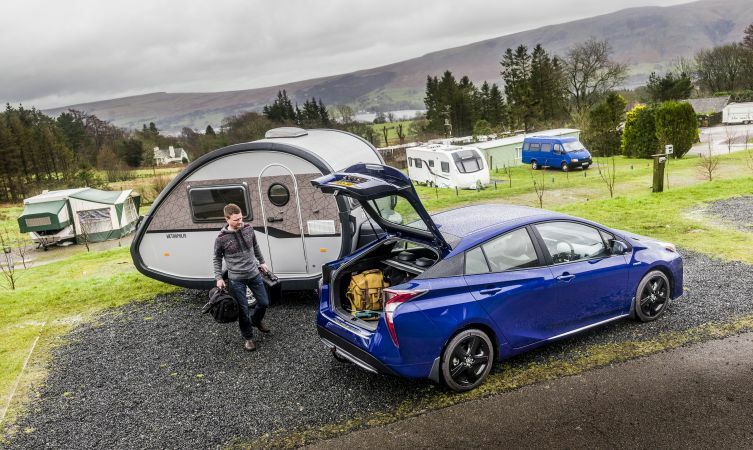 In order to sample this new-found towing ability, we decided to equip a Prius with a towing hitch and wiring kit from the official Toyota accessories line and head off into the beautiful Lake District – closely followed, of course, by our temporary ‘running partner’. 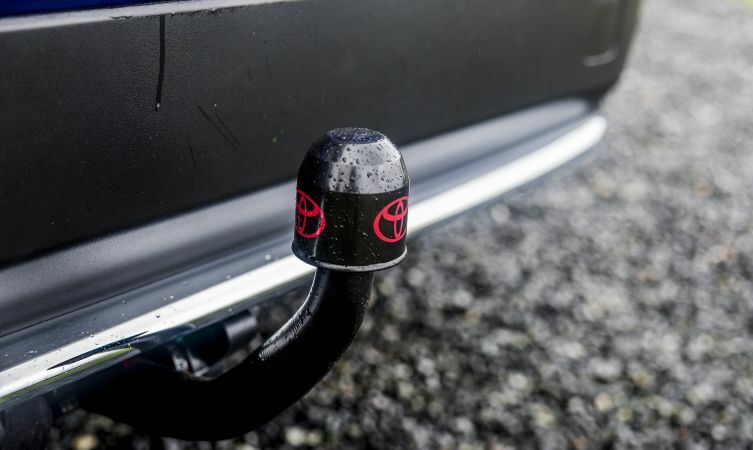 The beauty of Toyota’s detachable towing hitch is its discretion. When not in use, the towing arm can be stowed in the boot in its cloth bag, while the hardware connections are mostly concealed from view behind the lower edge of the bumper. Fitting follows a simple red/green guide, where the green indicators are only ever displayed when the towing hitch is fixed safely and securely in place. A similar red/green guide is also used on some trailers to ensure they are correctly coupled to the car. 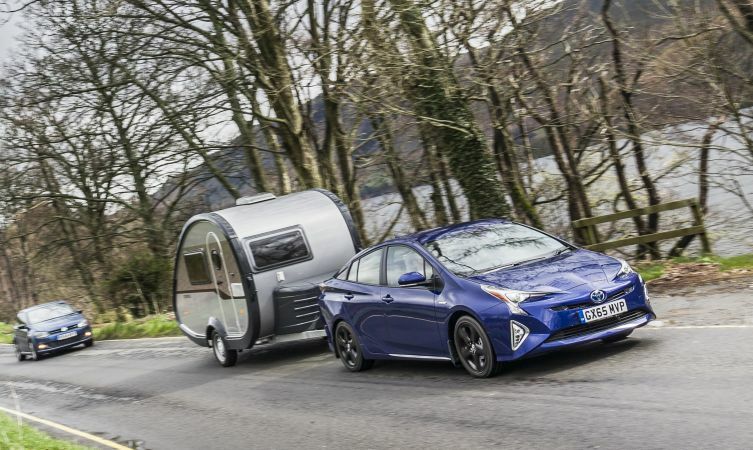 Although the new Prius has a relatively modest 725kg towing capacity compared with more traditional load-luggers, it is still possible to tow anything from small leisure trailers to pod-style caravans. 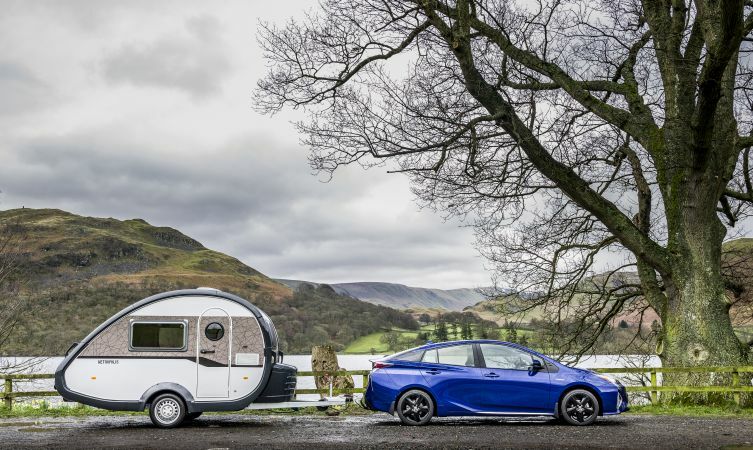 Sitting towards the upper end of the Prius’s towing limits with a normal running order mass of 650kg, the 2016 specification T@B 320 RS model pictured in this post was supplied by the very helpful staff at Adventure Leisure Vehicles in Cumbria. 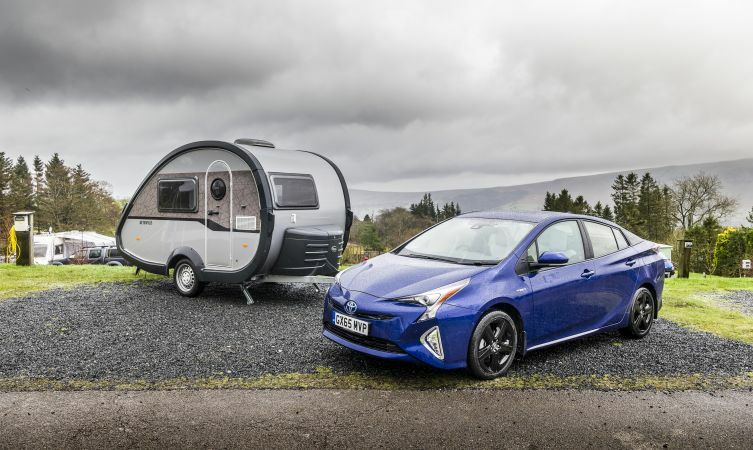 Offering a funky, retro-inspired design, the T@B 320 RS has a versatile and high-quality interior that manages to pack living and sleeping accommodation, a well-equipped kitchen and ample storage into a teardop shape that is the same length as that of a Toyota Aygo. Thanks to their distinctive, aerodynamic designs, the combination of Prius and T@B cuts a dash when passing in near-silence through picturesque Lake District villages. 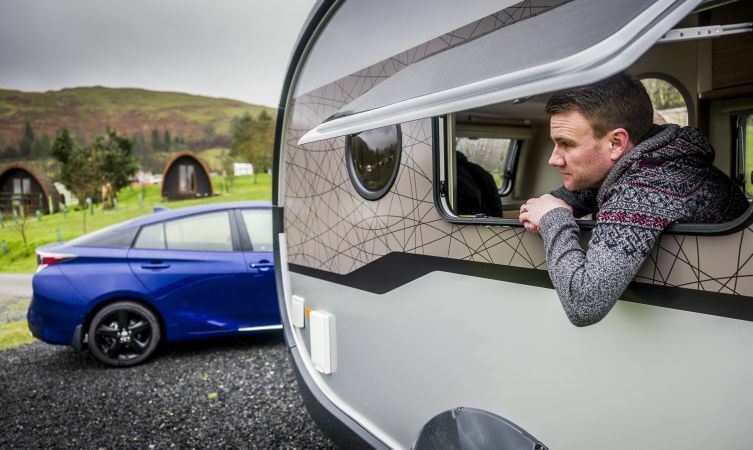 And as the caravan is narrower than the Prius it feels wieldy enough to snake confidently through the winding roads surrounding Ullswater, unconcerned about the width of oncoming vehicles. Our destination for the static photoshoot is the multi-award-winning The Quiet Site a few miles north-west of Ullswater. Located in the heart of the Lake District National Park, the all-weather site has become a favourite with campers, glampers, caravanners and nature-lovers alike. 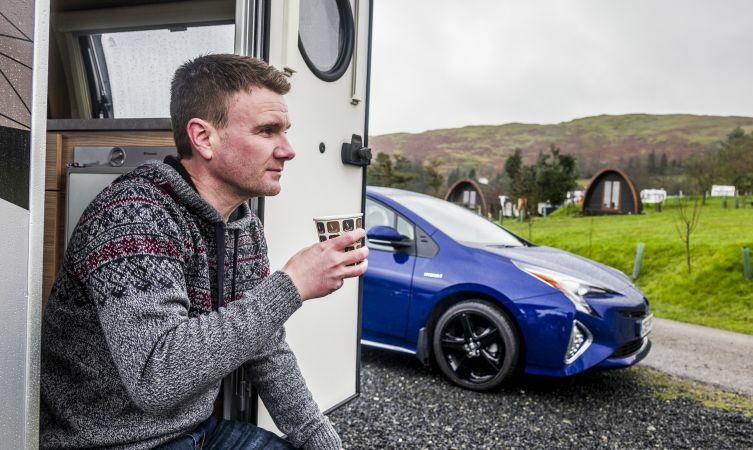 Like the Prius, the site has become well-known for its environmental credentials and sustainable policies, even being referred to by some as “probably the greenest park in Britain”. Situated in a secluded position within the fells, many of the pitches sit on staggered terraces that afford unobstructed views over Ullswater and the snow-capped mountains punctuating the skyline. It’s a perfect base from which to explore the Lakes or simply soak up the peaceful atmosphere. 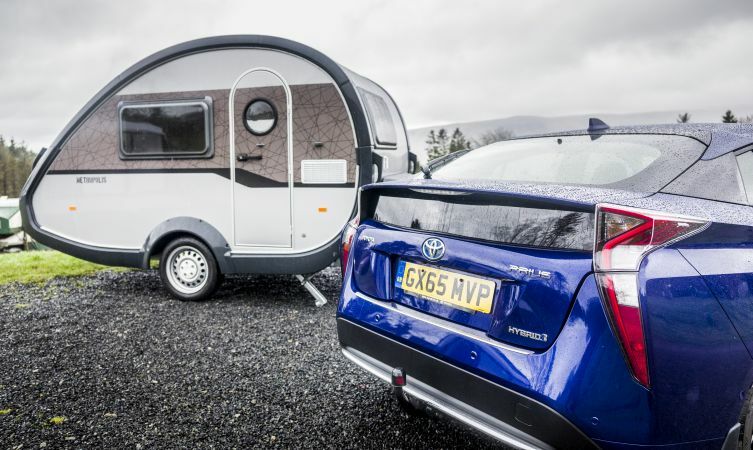 And what’s more, with the Prius’s ability to slink silently away on electric power – even with the caravan attached – there needn’t be any fear of rousing your fellow campers with the percussive clatter of a cold engine early in the morning. Learn more: What are the legal rules about towing? You can purchase a tow bar from your local Toyota Centre. If you want help locating your nearest Centre please follow this link: https://www.toyota.co.uk/find-your-dealer. Thank you for your comment. Having looked into the owner’s manual for the Prius 2011, we’ve found that the vehicle is not designed for towing and we don’t recommend the installation of a tow hitch on this vehicle. Many thanks.